Paris's Pere Lachaise - the most famous and romantic cemetery in the world - where lovers Heloise and Abelard, Oscar Wilde and singers Edith Piaf and Jim Morrison are buried ... and now where a shockingly modern love story dramatically unfurls. When Zade meets Driss in a Paris cafe, they are soon catapulted into thr world of young love. But soon tragedy strikes and Zade's brave new world falls apart. In despair, she retreats to her favourite haunt, Pere Lachaise cemetery, where help appears from an unexpected quarter. 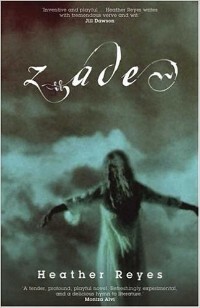 Zade is an astonishing and electric novel. It brings together the intimate playfulness of first love, the despair of loss and the irreverent wisdom of some of the most creative spirits ever to have lived.